Are heritage lists failing Deaf heritage? Deaf heritage sites can’t be found on England’s official buildings heritage list, either because the search facility doesn’t work, or because no mention of their deaf use is included in the searchable data. Try it for yourself. Go to the link above and search for ‘deaf’. You’ll find only ten items; seven deaf clubs (either current or defunct), two schools or parts of schools, and one church. Then widen the search by using the Historic England ‘whole site search’. That adds a further eleven sites, including a few more churches, monuments made by deaf sculptors, one building designed by a ‘deaf’ architect, and a headstone set up to mark the grave of a deaf man. It also includes the home of Dr Samuel Johnson in London… because Johnson is described in the blurb as “scrofulous, partially deaf and poorly sighted”. The last entry suggests that the search term can feature anywhere in the listing page, not just in the title. But that’s not actually so because despite the word ‘deaf’ featuring 14 times in the description of the recently listed Acton St Saviour’s Deaf Church, the search doesn’t locate it. To bring up St Saviour’s (and its sister church of St Bede’s) you have to search for ‘Maufe’ (the architect) and then scroll through four pages of results. You also have to know what you’re looking for because the titles given to them (‘St Saviour’s church and institute’, and ‘Church of St Bede and institute’) make no mention of deaf people, even though that’s who they were built for. This inability to search makes any work with UK deaf heritage virtually impossible. For example, this morning when the news of the state of the decay of the grade II listed Southport deaf school broke, a colleague and I went looking for its listing to see what was there. We found it eventually. It’s just called ’40 Lancaster Road’. And there’s no mention if it ever being a deaf school. In fact, the word ‘deaf’ doesn’t figure a single time in its description. I get that search tools can be tricky, and don’t always work very well. I get that a heritage designation team might look at a building with very focused interests that don’t include detailing its users. And I get that records might be out of date, or simply inaccurate. But all that aside, something has to change for these tools to be anything other than completely useless for our purposes. I also get that fixing this isn’t something that the heritage industry can prioritise, or even do – they just don’t have the information (yet). Fortunately, there is a way to pass it on to them. Historic England offer us a way to enrich the list with our own knowledge. We don’t know how that works, or what happens if we try… but we have to try, right? 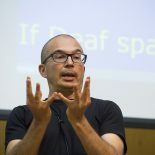 As an experiment, we’re going to try that enrichment process out, to see if – by adding information – we can drag deaf heritage out of its current invisibility and into the light. The LDS Church just announced they have elevated the Ogden, Utah (USA) Deaf Branch Building (https://ldsarchitecture.wordpress.com/category/meetinghouses/united-states/utah/ogden-area/ogden-deaf-branch/) to protected status, opening up a budget for upkeep, and the promise of never razing or offloading the property. Deaf Mormons are elated! This entry was posted on September 16, 2016 by Mike Gulliver in Musings.